This Porch Glider Bench is Amish made of eco-friendly poly lumber. 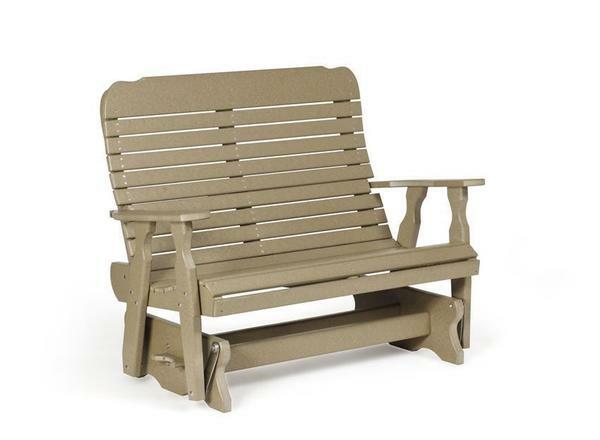 This poly lumber glider is one of our most comfortable outdoor benches available! The back is nice and high for support plus you have a curved seat for maximum comfort! Order this Amish poly lumber glider bench in a solid color or select a custom two tone look to fit with your personal style. This poly lumber glider comes with a five year limited warranty. This product usually ships within two to four weeks of purchase. Order the beautiful poly single glider in the photo for a matching set! At DutchCrafters we offer only American made outdoor furniture. Please call one of our Amish furniture specialists with questions at 1-866-272-6773. No Splinters,Splitting, or Cracking- always smooth to the touch! I would like to thank you and your staff for the professionalism shown in handling our glider situation. We received a brand new assembled glider and my wife and I are enjoying it as of this email. Again, thank you very much. I would definitely recommend your site and look forward in future purchases.